An exact definition of what is commonly called “brackish” water is hard to pin down. Brackish water falls between seawater and fresh water. Brackish water is similar to seawater except the salt content is less, as are the TDS (total dissolved solids). In another way of classifying, you start with fresh water, then go to brackish water, then to saline water, then to brine. The specifics of these classifications are often blurred. One authority states that brackish water begins at about 1000 ppm TDS and runs upward to around 10,000 or 12,000 ppm TDS. The basic process of treating brackish water in desalination applications is to pass pressurized water through a membrane. As fresh water passes through the membrane, brine or wastewater is rejected. Seawater treatment applications differ from brackish mainly in the level of osmotic pressure required to achieve fresh water. Typically, the pressure needed ranges in brackish water treatment from 5 psi to 75 psi, although the majority of brackish applications fall in the 145 psi to 290 psi range. Brackish water is generally a surface-type water and as such can be influenced by such environmental factors as rainfall and humidity. Ion levels and bacteria could be higher in the summer months compared to winter months, and salinity, nitrates, iron, silica and bacteria are a few examples of what is common in untreated brackish water. 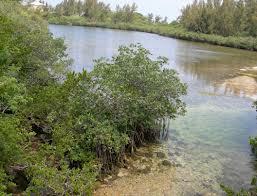 Viewed another way, brackish water is water that has more salinity than fresh water, but not as much as seawater. It may result from mixing of seawater with fresh water, as in estuaries, or it may occur in brackish fossil aquifers. The word comes from the Middle Dutch root “brak,” meaning “salten” or “salty”. Certain human activities can produce brackish water, in particular certain civil engineering projects such as dikes and the flooding of coastal marshland to produce brackish water pools for freshwater prawn farming. Brackish water is also the primary waste product of the salinity gradient power process. Because brackish water is hostile to the growth of most terrestrial plant species, without appropriate management it is damaging to the environment. If you prefer to think of this in parts per million, as is most common in water treatment, multiply the numbers in the table by 1,000. In summary, brackish water lies in definition somewhere between fresh water and sea water and is defined mainly by its salt content. Treatment is almost exclusively by membrane technology (reverse osmosis) or by distillation. References: Water Technology “Technical Feature” (March 2010) by Rich DiPaolo, Wikipedia, The Pure Water Occasional.